In a small bowl, combine the first eight ingredients. In another bowl, whisk the egg, milk, sweet potatoes and melted butter. Stir into dry ingredients just until moistened. Pour batter by 1/4 cupfuls onto a greased hot griddle; turn when bubbles form on top. Cook until the second side is golden brown. 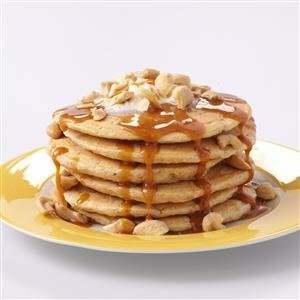 Drizzle with caramel topping; sprinkle with nuts. Serve with whipped butter if desired. Makes 6 servings.